The Flycraft 445F, is a centre console for the dedicated offshore fisherman.This hull is comfortable 20 kilometres out to sea or drifting the upper reaches of protected estuaries. Truly one of the rare craft that offers that velvet soft ride in the rough, and punt like stability at rest. With a 700mm internal freeboard,this package offers the safety and performance of a 6 metre alternative. Powered by a Yamaha FT60 hi thrust four stroke outboard motor the 445F achieves 72kph @ 5900 rpm. The hull has a power rating from 40hp to 90hp with a transom weight of 140 kg, & is hand laid with 6000 gram Biactual cloth to ensure maximum strength . 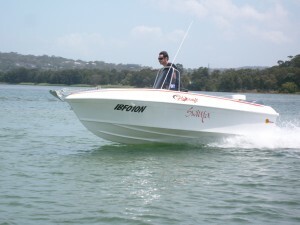 The Flycraft 445F Centre Console ia a 4.5 meter hull that performs like a 6 mt boat in the roughest conditions. With 700mm of internal freeboard the Flycraft is also very stable at rest. This well known hull was redesigned eight years ago to insure the longevity of one of the best hulls ever created. Options include - Hydraulic steering - Transom live bait tank - 70 litre under console fuel tank - Console seat box - Stainless bow rails - Navigation lights - Side pockets. Priced from $17,990.00 for the entry level hull this easy to manage, amazing hull is the fisherman's dream. The basic , package powered with a Honda F40hp fuel injected four stroke motor with "BLAST" low RPM power band , on a new braked trailer with registrations is - $34,950.00.